I used fresh raspberries and almond flour to create this lovely springtime dessert that is both delicious and healthy, well as far as desserts go. This time of year I can't resist adding fresh berries to as many recipes as I can specially when it comes to desserts. 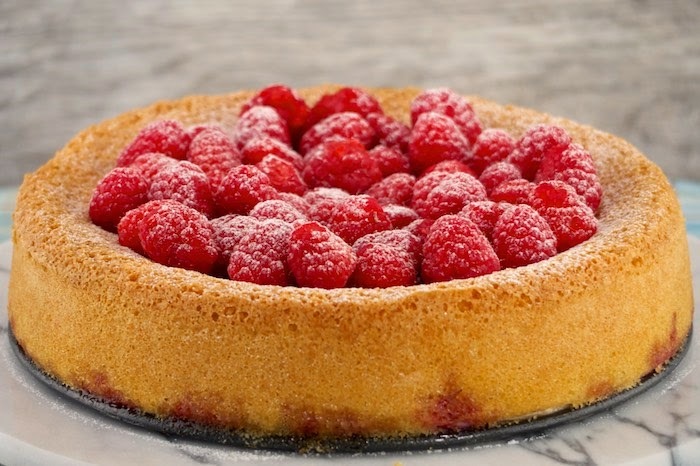 The raspberries, baked in the cake add moisture while the ones on top add a slight tartness. Serve it as a casual family dessert or as an elegant option at your next dinner party, either way everyone is sure to love it. Preheat the oven to 325°. Butter a 9-inch springform cake pan and line the bottom with parchment paper. Sift the almond flour with the baking powder and salt into a bowl. Add the eggs, sugar and almond extract to the bowl of an electric mixer and mix on medium-high speed until thick and glossy, about 15 minutes. Fold in the almond flour and 1 clam-shell of raspberries in alternating batches, ending with the almond flour. The batter will be thin. Pour the batter into the prepared pan and tap lightly on a hard surface. Bake the cake for about 50 minutes or until a tester inserted in the center comes out clean. Transfer to a rack and let cool for 10 minutes. Remove the cake from the pan and let cool completely on a rack. Top the cake with the remaining two clam-shells of raspberries and dust with powdered sugar. This looks delicious! I tried something similar over the weekend but it was quite complicated. This is much easier! How beautiful! Raspberries are one of my favorite fruits! Sounds so easy for such a beautiful outcome. Thanks so much for this recipe! What a perfect cake for spring and summer! Love anything with raspberries and almonds. I love fresh berries around this time of the year. They look perfect in this cake! This is my kind of dessert - simple to make, filled with fruit and delicious! Simply lovely! From here, the texture looks like angel food cake. Light and airy! Nom!! This looks so light and fresh! I love adding fresh berries to desserts as well, especially at this time of year. This looks delish!! I am always intimidated by baking but this looks simple & delicious! What a great-looking cake. I love the pop of colour from the raspberries... such a nice summery touch. This is just such a beautiful dessert, Theresa! Almond and raspberry is always such a lovely flavor combination. Perfect time of year to start baking and cooking with berries! I love this time of year for that very reason! Love the mound of raspberries! This sounds so fantastic for summer! Plus it's gluten free so double score! I am now re-thinking my cake choice for a brunch I'm hosting this Saturday. Visiting from #tryabitetuesday. That looks amazing -- what a lovely dessert. And those fresh raspberries! I'm glad everyone loved it!! Just what is "clam-shell" in terms of measuring?